No one alive today has actually seen the original surface of the world’s first successful combat submarine because the H. L. Hunley is completely covered by an encrusted layer of sand, sediment and shells that built up gradually over time around the vessel. Today, that’s about to change. 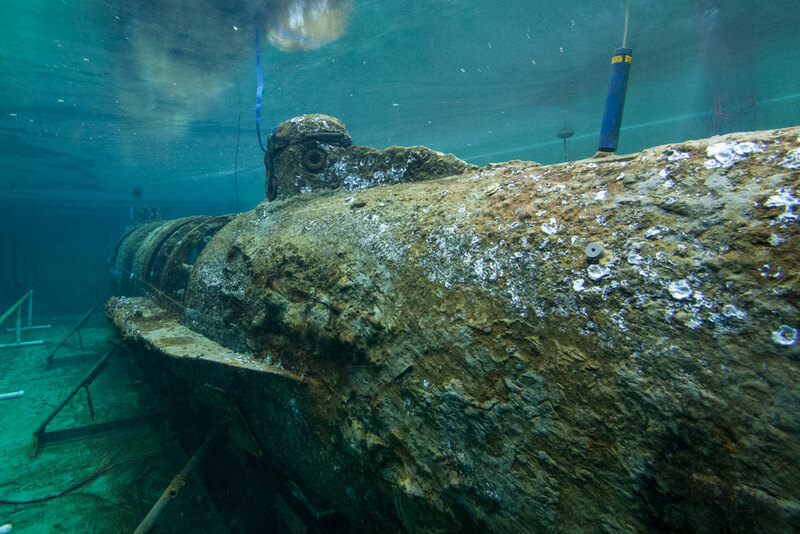 The true surface of the Hunley will slowly start to be revealed as Clemson University scientists kick off a year‐long effort to remove the brittle concretion masking the legendary submarine and some of her finer features. “In a short time, we will be able to view the real submarine, not the shadow we see now. This is an exciting step for everyone involved, but also has important scientific significance. Removing the encrustation will enable us to move forward with the final phases of the archaeological and conservation efforts surrounding the Hunley,” said Nestor Gonzalez, Assistant Director of Clemson University’s Warren Lasch Conservation Center. within minutes. With the concretion stripped away, archaeologists could uncover bullet damage that may have impacted the Hunley’s ability to return that night. Or, they could find countless other clues that will help solve one of the world’s greatest maritime mysteries. While removing the concretion may open up a new avenue of historical discovery, it will also allow for a complete conservation treatment to be applied to the fragile 19th century submarine. Lost at sea for over a century, the submarine was found in 1995 and then raised in 2000. The salts in the ocean water that permeated the Hunley’s iron skin during her 136‐years at sea are like poison, leaving her at risk for corrosion and disintegration if they are not removed. Since her recovery, the concretion has served as a protective cocoon, helping stop further corrosion that can be caused by exposure to oxygen. At the same time, the layer has served as a barrier inhibiting the team’s ability to implement a conservation plan necessary for the Hunley’s survival. Once the concretion is stripped away, it will allow for the free flow of a liquid conservation treatment to reach the metal of the submarine and leach out the salts threatening her existence. Conservators will be working within extremely cramped conditions using hand tools, chisels and hammers to remove the debris material. It will be stressful, with one wrong sleight of hand potentially resulting in damaging an irreplaceable piece of history. The concretion encases the entire vessel both inside and out. In some places, it is harder and stronger than the actual iron it covers. The Hunley has been soaking in a bath of sodium hydroxide for the last three months designed to loosen up the concretion and ease its removal. The chemical solution appears to have done its job, which will hopefully make the work go more quickly and without incident to the submarine. The deconcretion project may take up to twelve months to complete. During that time, the 76,000‐gallon tank that holds the Hunley will be drained of the chemical solution Tuesday through Thursday. The worksite will be an active caustic environment due to the presence of chemicals, making safety precautions for the scientific team of paramount importance. They will be required to wear face masks, gloves, specialized clothing and goggles the entire time to protect them from any chemical residue that may remain on the Hunley or in her tank. The concretion will first be chiseled away from the outside of the submarine then the team will move to the inside, where it is much more firmly attached. For the first few weeks, scientists will begin exposing exterior areas that were preselected due to their overall stability and low level of archaeological interest. This will allow for the team to hone their skills and acclimate to the environment before they face the complex challenges of working on potentially evidence‐rich areas and within the tight confines of the crew compartment. “All these years of careful study and research have been leading up to this moment. Over the coming months, we may finally learn the full story of the Hunley’s mysterious voyage and disappearance,” said Gonzalez.